Should I Ice or Use Heat? Our doctors use a variety of several different types of techniques to properly allign joints of the spine and extremities. Our mission is to provide safe, quality affordable chiropractic care to all ages of our community. 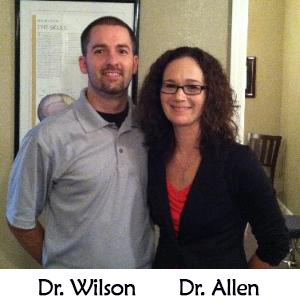 Dr. Allen & Dr. Wilson are both 2005 Palmer College of Chiropractic Graduates, who use a variety of different Chiropractic Techniques. Our office accepts most insurances, including Kaiser, Blue Shield, Blue Cross and Medicare. Call today and our staff will be happy to check your insurance to verify if it will cover chiropractic care.